On October 26, 2011, House Representative Lamar Smith (R-TX) introduced H.R. 3261, the Stop Online Piracy Act (SOPA). The bill was the House’s version of Senate Bill S.968, also known as the PROTECT IP Act, which was introduced on May 12, 2011 by Senator Patrick Leahy (D-VT). The stated purpose behind both bills was to provide increased protection for U.S. copyright owners against foreign websites that broadcast infringing content. Both bills were supported in large part by the recording and motion picture associations, but received harsh criticism from dozens of digital rights advocacy groups, technology companies, and media commentators. This criticism eventually lead to a worldwide day of protest on the Internet, with sites such as Wikipedia and Reddit shut-down operations and called upon users to contact their representatives to voice their opposition towards the bills. After receiving an unprecedented amount of calls and emails from their constituents, numerous supporters of the bills dropped their endorsements. As a result, both bills have subsequently been permanently stalled. The blackout campaign and the ensuing activist effort by Internet users may represent a key turning point in debates of the future of copyright legislation and reform. Commentators have noted that the very strong showing of public support suggests that while copyright law “was historically seen a technical system of rules” whose reach “only influenc[ed] the content industry,” the permeation of technology into the everyday lives of citizens has thrust the issue to the forefront of public consciousness. Following an earlier stalled attempt at passing similar legislation, on May 12, 2011, Senator Leahy introduced the Preventing Real Online Threats to Economic Creativity and Theft of Intellectual Property Act (the PROTECT IP Act or “PIPA”). The Act contained language that would authorize the Attorney General to initiate a civil forfeiture proceeding against a nondomestic domain name that is used in the U.S. and is associated with an Internet website “dedicated to infringing activities.” The Act defined an “Internet site dedicated to infringing activities” as an Internet site that has no significant use other than, or is marketed by its operator primarily as a means for, enabling or facilitating the reproduction, distribution or performance of copyrighted works. If a court grants an injunction, law enforcement officials can then serve court orders to operators of non-authoritative domain name servers to direct them to prevent access to seized domain names through the least burdensome technically feasible means. Non-authoritative domain name servers are intermediary servers used to resolve a domain name to its IP address; usually, they are general Internet service providers. An injunction also allows a law enforcement official to serve a court order to financial transaction providers (including credit card companies and PayPal), Internet advertising services, and information location tools (search engines) to require them to cut off service to the Internet site. Perhaps the most important addition to PIPA was its inclusion of a private right of action for IP owners. For domestically registered domain names, the Act allowed the owner of an IP right harmed by the activities of an Internet site to bring suit against a person who registered the site’s domain name. The Act also allowed for an IP owner to bring suit against a nondomestic domain name that is being used by a site dedicated to infringing activities. A federal court can then issue an injunction against the domain name if it is used within the U.S. to access the website. An IP holder could then use this injunction to order financial transaction providers and Internet advertising services to stop providing service to the website. In contrast to earlier legislation, the language of PIPA no longer required action by domain name registries to cut off access to an infringing site. Instead, the Act required action by nonauthoritiative domain name servers. The Act also required potential plaintiffs to make an effort at identifying a person connected with the infringing website before proceeding against the domain name itself. Seeking to introduce a bill in the House of Representatives that corresponded with the Senate’s PIPA, Representative Lamar Smith introduced the Stop Online Piracy Act on October 26, 2011. While SOPA contained several provisions that correspond with PIPA, it also had some key differences, most notably in respect to its private action provisions. SOPA contained two main titles, the first of which was originally called the E-PARASITE Act. Title I was designed to encapsulate most of the enhanced copyright protection provisions of PIPA. In accordance with this, § 102 of SOPA authorized the Attorney General to take action in federal court against foreign websites that are dedicated to offering infringing content. The bill allowed courts to order ISPs, payment network providers (such as credit card companies and PayPal), search engines, and advertising services to take “technically feasible and reasonable measures” to prevent U.S. citizens from accessing the content. SOPA’s provisions relating to private causes of action had some importance differences from those found in PIPA. SOPA’s § 103 creates a framework for rights holders to initiate such proceeding orders themselves, in a manner similar to the DMCA’s notice and take down procedures. Under SOPA, a rights holder could send a take-down notice to the accused website’s ISP or payment provider, stating that a website “engages in, enables or facilitates” infringement. Importantly, websites that deliberately acted to “avoid confirming a high probability” that the site is used to commit infringement also qualified for take-down notices. The ISP or payment provider would then have to forward the take-down notice to the website owner, who could respond via a counter notice if he had reason to object to the conclusion that the site was engaged in infringement. If a counter notice was received, then the ISP or payment provider would not have to cut off service. The rights holder would then have to pursue the action in federal court. In an important difference from PIPA, IP rights holder could initiate these proceedings against both U.S. and foreign-based websites under SOPA. From the start, numerous technology advocacy organizations, including the Electronic Frontier Foundation and Public Knowledge, voiced concern and opposition to both bills. Over 100 law professors, lawyers and practitioners signed letters against both PIPA and SOPA, expressing concerns that the bills were overly broad and would result in a curtailing of technical innovation and free speech on the Internet. Several technical groups and commentators also expressed concern that the bills would have a potentially disastrous effect on the Internet. Kent Walker, the Senior VP of Google, provided Congressional testimony that “DNS blocking itself could affect the Internet’s reliability, security, and performance.” In addition, others pointed out that the bills’ domain blocking approach would be ineffective, as the sites will still be accessible through their IP addresses. Notably, the Electronic Frontier Foundation stated that not only would the bills “sabotage the domain name system,” they would “effectively eliminate the DMCA safe-harbor provisions that have spurred much economic growth and online creativity.” EFF also voiced concern that the bill’s broad definitions of a website “engaged in or facilitating” infringement could be used to cut off support for services like Tor, which has been instrumental in providing tools for anonymous free expression, but can also be used to mask the identities of illegal downloaders. Numerous public interest groups pointed out that the bill would allow IP rights-holders to cut off a website’s support system without any proceedings ever taking place in court. The bills also faced stiff criticism from several technology trade groups. Fred Wilson, Principal of Union Square Ventures, expressed concern that SOPA would alter the DMCA safe-harbor landscape that has been instrumental in allowing start-up companies like Facebook and Twitter to avoid squandering money on litigation. The Future of Music Coalition refused to support SOPA, claiming that it “raises serious concerns about unintended consequences.” The Consumer Electronics Association, NetCoalition, and the Communications Industry Association sent a letter to the House expressing their opposition to the Act. Despite these numerous criticisms, both bills moved through their respective committees in Congress, enjoying broad bipartisan support and appearing to be on a fast track towards becoming law. Numerous websites soon began organizing days of protest as the bills moved through the legislative process. On November 16, 2011, the day that SOPA was debated in the U.S. House Committee on the Judiciary, Internet companies such as Mozilla, Techdirt and Tumbler took part in the “American Censorship Day” by displaying black banners over their site logos. In addition, after it was revealed that Internet domain name registration company GoDaddy.com supported the legislation, Internet users lead by the website Reddit staged a boycott of the site on December 29, 2011. This boycott resulted in GoDaddy.com changing its position to oppose the SOPA/PIPA legislation. Following these initial protest efforts, discussion began to formulate about a worldwide day of online protest against the bills. In December 2011, Wikipedia founder Jimmy Wales began discussion about the possibility of shutting down the popular user-contributed online encyclopedia. The social news website Reddit announced on January 10, 2012 that it would blackout the site for 12 hours on January 18, the day that one of its co-founders would testify before Congress about SOPA. Following a vote by the community in support of the proposal, Wikipedia announced that the English version of the website would be blacked-out for 24 hours on January 18, 2012. An estimated 75,000 websites from around the world joined in on the blackout effort. Websites that blacked out their sites for the day included Boing Boing, the icanhazCheezburger Network, Oreily.com, Imgur, Mozilla, and numerous others. Many other websites dramatically altered the appearance of their website while urging visitors to contact their Congressional representatives. Popular websites Google, Craigslist, Flicker all took part in such censoring efforts. The website sopastrike.com contains a list of all websites that took part in the blackout effort. 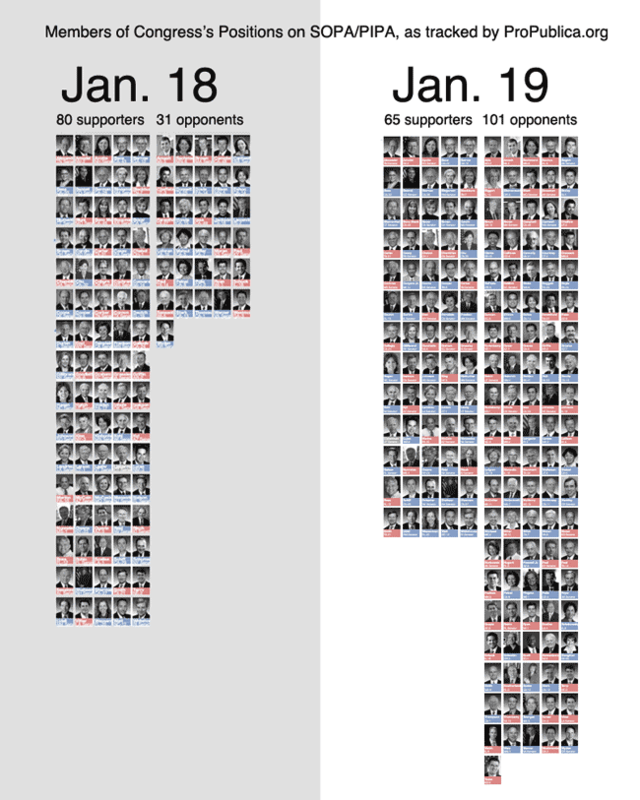 While a floor vote on SOPA was scheduled to take place on January 24, 2012, the vote was postponed. Senate Majority Leader Harry Reid instructed the bill’s main sponsor to work out a compromise between the interests of the content industries and the concerns of online protesters. Similarly, the House Judiciary Subcommittee announced that further voting on PIPA would be put off until a consensus could be reached. Subsequently, several media outlets reported that both bills have been shelved indefinitely. While the blackout movement definitely appears to be a significant moment in the history of the Internet and the future of copyright legislation, it is also clear that challenges lie ahead for this newly minted political contingency. Importantly, the movement has to determine and agree on what to do next, which may prove to be no small feat for what has traditionally been a decentralized environment. It is clear that creative content producers will continue to lobby for new legislation to protect their interests on the web. The question that remains is whether the Internet community will begin to exert the political force necessary to make sure that any such future legislation will not protect creative content at the expense of the continued evolution of the Internet. United States v. Jones Decided?